It's an effective start to a movie that frustratingly never capitalizes on this opening sequence in order to move beyond the unremarkable. Closed Circuit comes up with a clever enough framework through which to explore the ethics of pursuing terrorists. 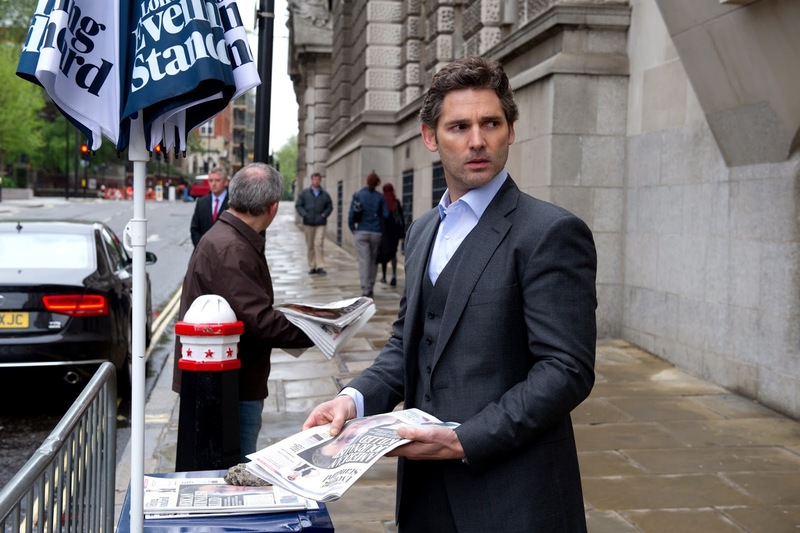 After his predecessor commits suicide, barrister Martin Rose (Eric Bana) takes on the defense of Farroukh Erdogan (Denis Moschitto), the man accused of masterminding the operation. Because it involves national security, evidence too secret for even Rose to examine will be presented in closed court where a special, government-authorized advocate for Erdogan, Claudia Simmons-Howe (Rebecca Hall) will push to allow it to be presented in open court. In the meantime, Rose and Simmons-Howe cannot meet for any reason, an insurmountable difficulty not only because they are former lovers but because Rose discovers that the British government was involved in the attack and will stop at nothing, not even assassination, to cover-up their part in it. The problem with Closed Circuit is not its convoluted plot, the mechanics of which are implemented quite effortlessly. The intriguing terrorism angle on an otherwise typical conspiracy plot is the only thing that saves the movie from feeling like a complete rehash. What makes Closed Circuit feel so boilerplate are its cipher-like characters. Not only was it a bad idea to meld a romantic backstory to this procedural; none of its characters have the depth to attract the viewer empathy Crowley hopes the romance will muster to get audiences invested in the picture. Martin Rose and Claudia Simmons-Howe could just as well be Gareth Everybloke and Jane Fancybird. Each of them is a stereotype described in as much detail by the names I've come up with as they are by the respective backstories the screenwriters did. Otherwise, despite the best efforts of Bana and Hall, two underrated and likable leads, the protagonists are blanks ...and not deliberately either, which means Closed Circuit missed its mark. Better to have gone the opposite way and have made a straight ticking-time-bomb thriller cross-cutting between all the players involved—the court, the barristers, MI5—a Hitchcockian Law and Order that eschews any kind of humanity and focuses on just-the-facts-ma'am process. As it stands now, Closed Circuit doesn't lean enough in either direction to satisfy its potential audience.